Son of Dr. John Deake and Hannah Foster Deake was born on Nov. 11, 1753 in Town of Hopkinton, Kings Co., RI. He moved to the Town of Richmond with his mother and the rest of the family, when his father died, and there received his schooling and grew to manhood. He apparently made frequent trips back to his home township and on Dec. 12, 1775 he married Mary Button at Hopkinton, R.I., Elder Thomas West officiating. 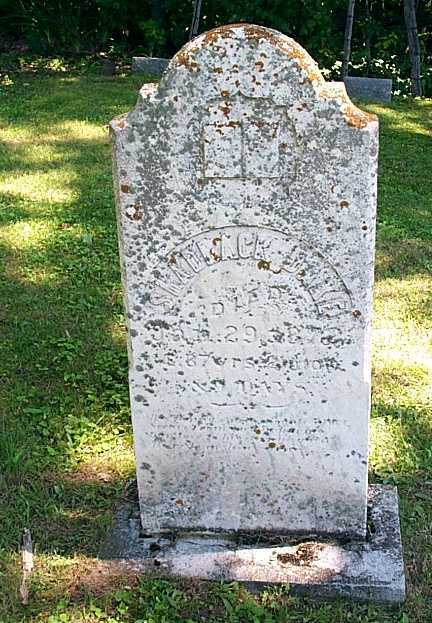 (She was the daughter of Joseph and Abigail Button, born Aug. 25, 1750 and died 1807-1808 in Vershire, VT. Her father had died about three months before her birth). In the 1777 military census he was listed as living in Richmond, R.I. 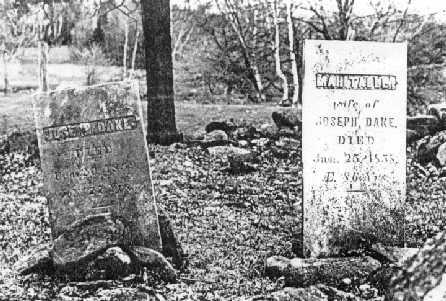 According to family legend Benjamin and Joseph Dake were soldiers in the Militia and served in the Revolutionary War. Records show that Benjamin Dake did serve in the Revolutionary War and before he died he applied for a pension from the Federal Government, but there is no record, yet found to show that Joseph Dake served in the Militia or the war. Joseph lived into the 1840's and he most certainly would have applied for a Federal Pension under the new pension law of June 1. 1832 if he had had any service. In 1781, Joseph along with his twin brother Benjamin moved to the Town of West Windsor, Vermont, where their brother John had moved about seven years before. He was listed in the Town taxlist for the year 1785 as having four acres, a couple of oxen and some cattle. The Federal Census indicates he had a second marriage. In 1786 he left Windsor with his family and moved to Vershire Co., VT. On Dec. 9, 1786 Joseph Dake purchased land in the Town of Vershire, Orange County, Vermont. He received a deed to more land in Vershire in November 1793. Here he lived for the next twenty-three years or more and here his family grew to adulthood. On December 20, 1809, he sold ninety-six acres, all of the land he owned in the Town of Vershire. His wife did not sign her name to the deed so apparently wives were not required to sign their dower rights to a deed. The Federal Census of 1800 indicates that she was still living then. After selling his land in December it is most likely that Joseph and his family lived on there until the spring 1810 when they left for points west. In the year 1802 John Dake, Jr. of Windsor had rode westward until he reached Lake Erie on the very western border of New York State. Here he purchased land in Niagara County from the great Holland Land Company. The records do not show that he returned to Vermont but by 1810 there was a large migration of Vermonters into the western counties of New York, including Joseph Dake and wife, his son Ebed and wife, and Joseph and Mary's son John also the widow Susannah Dake, her daughters and their husbands. Joseph Dake settled in the Town of Holland, in what later became Erie County. He is listed in the Census of 1820, 1830 and is shown living with son Ebed in 1840. His son John, married in the Town of Holland. Helped establish the village of Protection, New York where he manufactured spinning wheels and chairs and in the 1840's he had a sawmIL. He is buried in the village cemetery on Vermont Hill road. 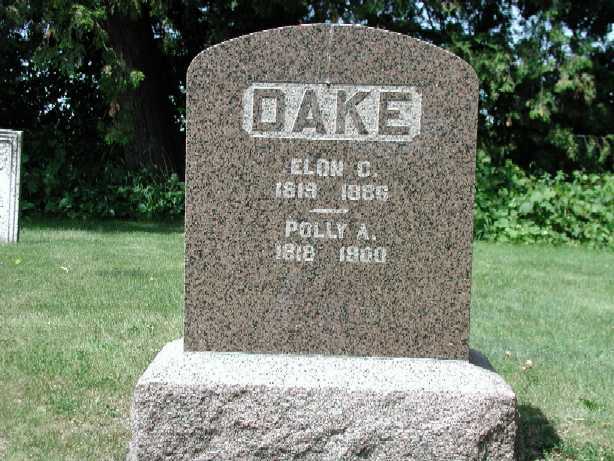 There are today, several families of Dakes' living in Erie county, New York, and as late as 1940 one of them had an old Bible in which the two quotations were found: "Shadrach Dake born November 20, 1784""Joseph Dake and Mary Button were married December 12, 1775 Windsor, Vermont." (The Windsor Vermont is wrong). Joseph Dake died in the late 1940's at Rushford, Allegany Co., NY. He was buried in the Town of Holland, Erie Co, NY. Mathena was born between 1779 and 1780 in Hopkinton, R.I. to parents Joseph Dake and Mary Button. She married a Thomas Sessions of Orange Co., Vt.. They had three children (Son Cornelius V. born about 1828 and one daughter: Nancy Mary Sessions was born in 1817 in Stowe or Mansfield, VT. Mathena married Edwin (Edward) Hayes. She died June 25, 1885 at Cambridge, VT). Mathena died between 1830 and 1840 in Mansfield, Chittenden, VT.
Benjamin was born on Feb. 7, 1791 in Windsor, Windsor, Vermont to parents Joseph Dake and Mary Button. In 1786, he moved with his parents to the Town of Vershire, Orange Co., Vt. He married Mahitable Henderson on Oct. 9, 1800 at Stowe, Lamolle, Vermont (Daughter of Samuel and Dorothy "Dolly" Thompson Henderson. (She was born in 1772 at Waterboro, Maine and died in Jan. 25, 1858 at Stowe, Lamolle, Vermont). They had two children. About the year 1805, Benjamin with his dog and gun, went out hunting one day and never returned. It may be that for a long time the family never knew what happened to him. However, the Vermont records show that Benjamin Dake went back to Tunbridge, Orange Co., Vt., and the Town adjacent to Vershire where he was remarried to Mary N. (Polly) Colby, on Oct. 9, 1808. (She was born on Oct. 9, 1788 at Danville, Rochingham, New Hampshire to John and Hannah (Perham) Colby. She died March 2, 1864 at Barry Twp., Barry, Michigan). They later had 11 children. Mahitable married his brother Joseph Dake Jr., about 1808 at Mount Mansfield, Chittenden, Vermont. Benjamin served in the War of 1812 in Capt. Brigham's Company, Col Jonathan William's Regt. He served in the NY Militia for 2 months and 9 days. In Sept. 1814 he volunteered to go to Plattsburgh and served in Capt. Ebenezer Spencer's Company, Vershire, Vermont. About 1819 he moved to the Town of Holland, Erie, New York. In 1820 he was listed as living in Holland, Erie Co., N.Y. (3 males under 10; 1 male 10 to 16; 2 females under 10; 2 females 10 to 16) In the 1820's he moved to Rushford, Allegany, New York (Podunk area) where he was part owner of a sawmill with Oliver D. Benjamin. He moved again in the 1840's to Barry Twp., Barry, Michigan. Polly died on March 2, 1864 in Wyoming Co., New York and was buried in Arcade Cemetery, Arcade, Wyoming, New York. There is no record of his divorce from his first two wives. He married a third time in Michigan to Clarissa Richards, on June 1, 1845 in Barry Twp., Barry, Michigan (Daughter of James Richard; born about 1815 in New York and died 1915). They had one daughter; Esther Ann Dake. He moved to Newaygo Co., Michigan in 1860 and bought land from Samuel Bruce on May 17, 1864 in Denver Twp., Newaygo, Michigan. 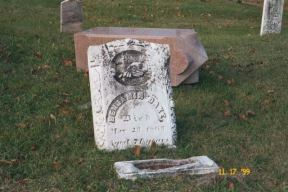 He died on May 23, 1865 in Denver Twp., Newaygo, Michigan and is buried in Bull Cemetery, Hesperia, Newaygo, Michigan. Joseph Dake of Stowe in Lamoille County & State of Vermont being in a very infirm state of health and sensible of my liableness to sudden death at the same time being of sound mind do judge it best to make and accordingly do make herein and hereby this my last will and testment It is my will that all my just debts and the charges of my funeral be paid and discharged by my executor hereinafter named and appointed out of my estate as soon as conveniently may be after my decease and it is my will that suitable grave stones be erected at my and my wifes graves I give and dispose and devise all of my estate both real and personal after paying my just debts funeral charges & gravestones as follows. The grave of Joseph Dake located in an old cemetry near a country road up in back of the Village of Stowe, Vermont. Joseph Dake son of Joseph and Mary Button Dake was born at Windsor, Vermont in 1782. Died at Stowe, Feb. 20, 1859. In 1803, a military company was organized in town, commanded by the following named officers: John Seabury, Capt. ; Daniel Lathrop, Lieut. ; David Moody, Ensign. This company continued in existence until the war of 1812, during which four or five of its members were drafted in the service. When the battle of Plattsburg occurred, Sept. 11, 1814, there were two military companies existing in town; one was called the "Light Infantry" and the other, "The Floodwood." Besides, there were a few men who belonged to an organization, existing in Washington County, called the "Light Horse." The British came into Plattsburg on Freeman's meeting day, the first Tuesday of September. On Wednesday following, cannonading was distinctly heard at Stowe. About midnight, Wednesday, some of the citizens of the town were aroused, and informed of the condition of things at Plattsburg, and the country adjacent. The night was dark and rainy, and the roads were very muddy. No one had any authority to call out a single man, and no military officer attempted to call out any man, or exercise any control over them. However, a portion of both military companies, and one or two of the horse company, and perhaps a few men belonging to no company, in all about 50 men, got together in a short time, and in the night, without rations, guns or ammunition, and some of them poorly clothed, and scarcely shod at all, started for Waterbury, through the woods, which then inclosed nearly the whole way. Their tramp, for it could not be called a march, through the mud, with the rain occasionally pouring down, was any thing but pleasant for men, even with stout hearts, inspired by the most patriotic motives. They reached Waterbury about day-light, and found portions of companies form Montpelier, Middlesex, Waitsfield, and other towns in Washington County, who had come there under circumstances similar to their own, gathered together on a plat of ground, in a sort of parade, and Col. John Peck was then making a speech to them. They joined the throng, which were advised by Col. Peck, to make the best of their way to Bullington, without regard to order, and rendezvous near the college. They started from Waterbury, and on their way, got a little something to eat, in the houses along the road, as they could find any thing. At the time, one Eldridge kept a hotel about three miles east of Burlington, at which place they arrived about night, and endeavored to obtain permission to rest their weary bodies, on and about his premises. It seems he had little sympathy with them, in their efforts, and refused to have them on his premises. They told him plainly they would not be refused, and they filled his barns and sheds with lodgers; some of the Stowe men found in the morning that they had slept under the droppings of the turkey roost. In the morning they roused, and at nine o'clock were gathered in parade at Burlington, near the college. Here Col. Peck made a speech to the men, in which he signified his purpose to cross the lake to Plattsburg, with such men as saw fit, voluntarily, to follow him. He said he would not even advise any man to go, who was not inclined to do so, or even who feared he might be sorry, if he did. To determine who was disposed to follow him, he requested that, when he pronounced the word "march" , those who were not inclined to go, should step three paces in the rear. When the word was given, more than one half remained firm in their position. At this time, there were about 150 men on the ground, and at Burlington, from Stowe. Some had started later in the night than the first squad and some the next day, and others still later, even up to Sunday. Col. Asabel Raymond, Captain of the "Floodwood" company, returning home from Boston Saturday night, started, the same night, for Burlington. Not reaching his command in time, the men from both companies submitted to the command of the officers of the "Light Infantry" company. After ascertaining who was going to cross the lake, they drew their rations. The eatable was whet bread. They procured some pork and beef, and a large kettle for boiling it; and had but half boiled it, when the drum called them to march to the wharf, to be ready for crossing. They put their half-cooked meat in bags, and some of the men swung them over their shoulder, and as they walked, the grease dropped down their backs on to their heels. The loaves of bread, which were very large, were carried by thrusting a stick through them, and shouldering them. On their way to the wharf, they drew their guns, which had just been returned from Montpelier, where they had been sent, for greater safety. Friday night about sundown, as many as could, went aboard the watercraft, which was to convey them across the lake. This craft was an open-top sailboat, with much the appearance, when viewed from the shore, of a common sheep-yard. Up to this time, the men had eaten little or nothing that day. When the boat had been sailing about two hours, it was be-calmed and began to leak. The men were called upon, and to make any considerable progress, were obliged to bail and row by turns, all night. Saturday morning about daybreak, they reached "Ketchum's Landing" in Peru, as they did not choose to go direct to Plattsburg. About 40 men from Stowe, crossed in this boat. More come over Saturday and Sunday. The main battle, which was on Sunday, was fought and decided by the defeat of the British forces, without the men from Stowe being called into actual fight; though they were in situations of danger, and were among the flying bombs and bullets. None of them happened to be killed, or wounded. On the following Wednesday, they recrossed the lake in a sloop, delivered their guns back at the arsenal, and came home on Thursday following. Many men from this town, who denied to cross the lake to Plattsburg, could not find conveyance. Those, and such as did not desire to cross, having heard the news of victory, came home early in the week. Under the act of Congress passed many years since, providing for the payment of one month's wages, to those who were "actually in the battle of Plattsburg," all who volunteered, at Burlington, to cross the lake, received pay; it being considered that, in legal contemplation, they were actually in the battle. By a more recent act of Congress, each of them, also, received a warrant for a quarter section of public land. Shadrach was born on Nov. 20, 1784 in Windsor, Vt. to parents Joseph Dake and Mary Button. He served in the War of 1812. (Pension No. 16796). He married Mary (Polly) Allen in Washington Co., N.Y.(she was previously the wife of John Dake of Greenfield, N.Y and the daughter of Ebenezer and Sybil Allen) They moved to Macombe, St. Lawrence Co., N.Y. There he married Sarah (Sally) Boyington; they had one son (she died in Oct. 1877). In 1823 he sold land in Saratoga Co., N.Y. Later he married Mary Lamond; they had one daughter. Finally he married Electa Petrie; they had two daughters. He died on Jan. 29, 1872 in the Town of Macomb, St. Lawrence Co., N.Y and is buried in the Macomb 1st Cemetery. Shadrack was born on Nov. 5, 1838 at Macombe, N.Y. to parents Shadrack and Sarah Boyington Dake. He married Mary Smithers (she was born June 26, 1839 and died March 10, 1907).. He died on Jan. 5, 1912 at Macombe, N.Y. Both Shadrack and his wife Mary are burried in the Macomb 1st. Cemetery, Macomb, NY. Charles was born in 1868 to parents Shadrack Dake and Sarah Boyington Dake. He married Elizabeth A. Richardson (she was born in 1866 and died in 1947). He died in 1936. Mary was born to parents Shadrack and Mary Lamond. She married Paul (last name unknown). Barbara was born to parents Shadrack and Electa Petrie. Electa was born to parents Shadrack and Electa Petrie. Asenath was born on Feb. 26, 1829 in Canada to parents Shadrack and Sarah (Boyington) Dake. Sally was born in 1817 in Erie Co., N.Y to parents Ebed M. B. and Hannah Dake. She married Michael Moulton. Ebed, Jr. was born in 1816 in Orange Co., Vt. to parents Ebed M. B. and Hannah Dake. In the 1850 census of Herman, Dodge Co., WI Ebed, Jr. was listed as 34 years old and a farmer. The Barthelomew Ringle family from Bavaria was living in the house with Dake. Joseph was born in 1819 in Erie Co., N.Y. to parents Ebed M. B. and Hannah Dake. He married Mandane A. (last name unknown). In the 1860 census of Chester, P.O. Atwater, Dodge Co., WI, Joseph and family were listed. He was listed as a farmer. Caroline was born in 1843 to parents Joseph and Mandane Dake. Emeline was born in 1844 to parents Joseph and Mandane Dake. Viola was born in 1846 to parents Joseph and Mandane Dake. Edwin was born in 1853 to parents Joseph and Mandane Dake. Almor was born in 1856 to parents Joseph and Mandane Dake. John was born on July 12, 1796 in Vershire, Orange Co., VT to parents Joseph Dake and Mary Button Dake. In 1810 he was listed as living in Genesee Co., N.Y. He was married about 1815 in Holland, Erie Co. NY to Sally (Sarah) Colby (she born in 1798 in Vermont to parents Ezekiel Colby, Jr. and Ruth Davis). In the 1820 census he was listed in Holland, Niagara Co., N.Y. (2 males under 10; 1 male 18 to 26; 1 female under 10; and 1 female 16 to 18, probably his wife) In 1830's he owned a lathe shop in Protection, N.Y., where he made chairs, tables and spinning wheels. By 1840 he built and owned a sawmill in Holland, Erie Co., NY. He died on Mar. 8, 1846 in Protection, Holland Twp., Erie Co., NY. He is buried in the Protection Cemetery, Holland, Erie Co., NY. Fanny was born in 1815 in town of Willink, Niagara Co., N.Y. to parents John and Sally Colby Dake. George was born on Nov. 14, 1816 in Protection, town of Holland, Erie Co., NY to parents John and Sally Colby Dake. He married Sarah Minerva Andrews in 1838 at Holland. (She was born on Sept. 18, 1817 at Protection, N.Y. She died Jan. 7, 1858 at Sardinia, N.Y.) He married a second time to Tryphenia Susannah Hopkins in 1858. (She was the daughter of Alvah and Susannah Hopkins; born on June 25, 1832 in Vermont. She died on April 25, 1917 at East Aurora, Erie Co., N.Y. Death was due to a fall down the stairs). The 1866 Erie County Atlas shows George owning land on Lot 55, Range 6, Township 7, Warner Gulf Road, Sardinia, Erie Co., N.Y. He died in March 7, 1901 at East Aurora, Erie Co., N.Y. and is buried in Oakwood Cemetery. Alvah was born on Dec. 20, 1859 in Sardinia, Erie Co., N.Y. to parents George P. and Tryphinia S. Hopkins Dake. He married Ida May (Mary) Spencer (She was born in 1884 and died in 1908. Her parents were John and Huldah (Bates) Spencer). He married a second time to Ethel Smith. He died on Oct. 12, 1917 at East Aurora, N.Y. and is buried in Oakwood Cemetery. Florence was born on Feb. 15, 1886 at Salamanca, N.Y. to parents Alvah F. and Ida May Spencer Dake. She married Christopher Monsell on Nov. 28, 1907 at Patchogue, Long Island, N.Y. She was a member of the Christain Church and was a staunch worker and a loyal supporter of the church before her health was impared. She was a member of Colfax Rebeah Lodge and Old Glory Council Daughters of America. She had two daughters: Ida Mary (married George H. Dalrymple, she died Dec. 31, 1908) and Florence Evelyn (she married Clifton Bixby, died on Dec. 18, 1904). Florence died on Oct. 20, 1935 at Amesbury, Mass. Merrit was born on March 18, 1891 to parents Alvah F. and Ida May Spencer Dake. He married Susan Smith on Jan. 2, 1910. He died on Feb. 14, 1946 at Brooklyn, N.Y.
Claremont was born on May 29, 1911 to parents Merrit A. and Susan (Smith) Dake. He married Florence (last name unknown) on Aug. 5, 1939. He died on July 4, 1975 (place unknown). Pearl was born to parents Alvah F. and Ethel Smith Dake. Raymond was born to parents Alvah F. and Ethel Smith Dake. Clarence was born to parents Alvah F. and Ethel Smith Dake. Orrin was born on April 1, 1864 in Sardinia, N.Y. to parents George P. and Tryphinia S. Hopkins Dake. He served in the Civil War. About 1890 he married Mary Ikens. (She was born in 1871 and died in 1948). He died on March 21, 1952 and is buried in South Wales Cemetery, Erie Co., N.Y.
"Funeral services for Orrin G. Dake, 87, of Wales Hollow were held, Monday afternoon, March 24, from his home in East Creek road with the Rev. Grover Thompson of the Strykerrsville Baptist Church officiating. Burial was in Wales Hollow Cemetery. Mr. Dake died Friday, March 21, 1952, at the home of his son, Claude of Fish Hill road, Town of Wales, after an illness of 10 days. He was born April 1, 1864, in Sardinia. Mr. Dake had lived in the Town of Wales practically his entire life. Mrs. Dake died June 5, 1948. A brother Grant Dake of East Aurora, died last January 9. Mr. Dake was an honorary member of the Wales Hollow Parent-Teacher Association. Besides his son, Claude, Mr. Dake is survived by two sisters, Mrs. Lillian Roswell, Aiken, S.C. and Mrs. Alvina Hearn, Grand Rapids, Mich,; Two grandsons, Lynn, Buffalo, and Lyle Dake now serving in the United States Army at Belvoir, Va. and four great grandsons, Gordon, Gary, Dennis and Donald Dake of Bullalo. Claude was born in 1892 to parents Orrin G. and Mary Ikens Dake. He married Alice R. Keyser. He lived in Wales, N.Y. He died in 1958. Lyle was born on Oct. 13, 1925 in Wales, N.Y. to parents Claude O. and Alice Keyser Dake. He was a graduate of East Aurora High School. He served during WWII in the Army and was stationed at Belvoir, Va. He was associated with the New York State Electric and Gas Corp. for 3 and one half years. He died on July 6, 1963 of a heart attack. Christa was born to Lyle G. Dake. Lynn was born to parents Claude O. and Alice Keyser Dake. He lived in Buffalo, N.Y.
Gordon was born to Lynn Dake. Gary was born in 1944 to Lynn Dake (spouse unknown). He served in the US Army as a PFC in Vietnam. H died in 2006 and is buried at Holmes Hill Cemetery, Town of Wales, East Aurora, NY. Dennis was born to Lynn Dake. Donald was born to Lynn Dake. Alvina was born on June 25, 1862 in Sardinia, Erie Co., N.Y. to parents George P. and Tryphinia S. Hopkins Dake. She was married three times. (1) to a Fuller; (2) to a Westover and (3) to Alfred Hearn. For awhile they lived in Grand Rapids, MI She died on Jan. 5, 1959 and is buried in Stamford, Michigan. Perry was born on Aug. 20, 1865 in Sardinia, N.Y. to parents George P. and Tryphinia S. Hopkins Dake. He married (1) Celia B. Webb; (2) Lydia B. Hammeister (1869-1940); (3) Mayme Perkins. He was said to have built the first concrete sidewalks in East Aurora, N.Y. They had one adopted daughter; Evelyn. (She married Nelson Holt). He died in 1946 and is buried in Oakwood Cemetery, East Aurora, N.Y.
Grant was born on Oct. 6, 1868 in Sardinia, Erie Co., N.Y. to parents George P. and Tryphinia S. Hopkins Dake. He married Clara C. Steck on April 26, 1903 in Erie Co., N.Y. (She was born on Dec. 9, 1873 and died on May 11, 1937 at Erie Co., N.Y.). He died on Jan. 9, 1952 in East Aurora, N.Y. and left several descendants. Margaret was born on Feb. 19, 1904 in Erie Co., N.Y. to parents Grant U. and Clara Steck Dake. She married Olin West. (He died on July 17, 1968). At one time she lived at 149 Center St., Waverly, N.Y.
Elloise was born on July 29, 1905 in Erie Co., N.Y. to parents Grant U. and Clara Steck Dake. She married June 25, 1931 to Elmer V. Trew. She lived at Gunbarrel Rd., Baldwinsville, N.Y.
Norma was born in Jan. 1907 in Erie Co., N.Y. to parents Grant U. and Clara Steck Dake. She married a Clarence Cluney. She lived at Linden Ave, East Aurora, N.Y.
Percy was born on April 19, 1909 in Erie Co., N.Y. to parents Grant U. and Clara Steck Dake. He married Verna Rogers. They lived at 1180 Olean Rd., South Wales, N.Y.
Florence was born on Aug. 15, 1910 in Erie Co., N.Y. to parents Grant U. and Clara Steck Dake. She married Merle Hopkins. They lived at Java Lake Park, Arcade, N.Y.
Madora was born on Dec. 28, 1914 in Erie Co., N.Y. to parents Grant U. and Clara Steck Dake. She married Anton Johnson. They lived at Factory Rd., Strykersville, N.Y.
Helen was born in 1918 to parents Grant U. and Clara Steck Dake. She died in 1921. George was born in 1908 to parents Grant U. and Clara Steck Dake. He died in 1909. Baby daughter born to parents Grant U. and Clara Steck Dake. The baby died on Aug. 13, 1913. Lillian was born on Jan. 1, 1871 in Sardinia, Wales Twp., Erie Co., N.Y. to parents George P. and Tryphinia S. Hopkins Dake. She married a George H. Rowswell and had one daughter; Naomi. (Naomi married Easton Cook Trenary; he was from Boyce, Va. and settled in Aiken, S.C. He died on Dec. 26, 1982) She died on Oct. 23, 1965 at the home of her daughter in Aiken, S.C. and is buried in the Bethany Cemetery. Orpha was born to parents George P. and Tryphinia S. Hopkins Dake. She married Harry Waufull and had one son: George. Cyrene was born in 1842 to parents George P. and Sarah Minerva Andrews Dake. Cylinda was born on April 11, 1843 to parents George P. and Sarah Minerva Andrews Dake. George was born on Sept. 19, 1847 to parents George P. and Sarah Minerva Andrews Dake. Listed in the town of Sardinia, N.Y. in 1883 and was one of the inspectors of an election. He died on Dec. 8, 1934. Fanny was born on September 7, 1848 to parents George P. and Sarah Minerva Andrews Dake. She was married to a Mr. Wasson. She died in New York on January 29, 1902 of heart problems and is buried in the Maplewood Cemetery, Springville, Erie, New York (Section 13). Vernon was born on April 23, 1851 in the town of Holland, Erie Co., N.Y. to parents George P. and Sarah Minerva Andrews Dake. He married Sarah Sophrona Blood in 1879. He died on Dec. 16, 1908 in Ellery Township, Chatauqua Co., N.Y.; leaving serveral children. Earl was born on Oct. 5, 1880 in Erie Co., N.Y. to parents Edwin Vernon and Sarah S. Blood Dake. He married on March 7, 1905 to Bernice De Leo Haskin. (She was born on Sept. 23, 1887 and died on July 15, 1963). He died on April 22, 1969. Ruth was born on Jan. 18, 1906 to parents Earl B. and Bernice Haskin Dake. She married Harold Cochrane on Aug. 2, 1922. She married a second time to Stewart D. Logan. They were the parents of Adelia Ruth Cochrane; born Dec. 8, 1923. (She married Milton A. Johnson). Margaret was born on Nov. 23, 1907 to parents Earl B. and Bernice Haskin Dake. She married R. Earl Pickard. They were parents of Mervin Earl Pickard (born April 27, 1926 and married Nov. 24, 1945 to Norma Louise Walker. Second marriage to Doris Ackley Welch.) They were also the parents of Elizabeth Mae (Betty) Pickard (born on July 23, 1928. She married Oct. 7, 1946 to Vincent Leroy Rothwell). Also had son Robert James Pickard (born Feb. 13, 1931. Married June 18, 1955 to Lillian Vivian Wilson). Margaret Elizabeth was also the mother of a set of twins born on Dec. 22, 1932, Janet Marie who married April 12, 1952 to Ivan Charles Tucker and Janice Mary who married July 26, 1952 to David Lavern Peterson. Sophrona was born on Feb. 16, 1910 to parents Earl B. and Bernice Haskin Dake. She married Nov. 25, 1926 to Noah William Foster. They were the parents of Lavern Ross Foster, born Oct. 5, 1927 and married November 25, 1947 to Nellie May Collins. Also parents of Della May Foster, born May 12, 1929 and married on Oct. 2, 1946 to Harold C. Wing. She married a second time on Aug. 11, 1966 to Gerald R. Herrington. Fred was born on Mar. 3, 1912 to parents Earl B. and Bernice Haskin Dake. He married Louise Sinclair. He married a second time to Virginia Owen and a third time to Gertrude (Trudy) Shaw on May 7, 1960. Dorothy was born to parents Fred E. and Louise Sinclair. Dale was born to parents Fred E. and Louise Sinclair. Delberta was born to parents Fred E. and Louise Sinclair. David was born on March 10, 1938 to parents Fred E. and Louise Sinclair. ABDFBMADE. Fred Edwin Dake, Jr.
Fred was born on Aug. 2, 1939 to parents Fred E. and Virginia Owen Dake. George was born on Dec. 23, 1915 to parents Earl B. and Bernice Haskin Dake. He married Barbara Ruth Comstock. James was born on July 10, 1945 to parents George L. and Barbara Comstock Dake. He died Aug. 14, 1961. Leslee was born on Nov. 17, 1952 to parents George L. and Barbara Comstock Dake. Lucile was born on June 11, 1921 to parents Earl B. and Bernice Haskin Dake. She was maried on Oct. 23, 1942 to James W. Scofield. They were the parents of: Donna Gay Scofield, born July 17, 1945; Pamela Faye Scofield, born Nov. 2, 1947; Shari DeLeo Scofield, born Sept. 25, 1958; Julie Milissa Scofield, born Sept. 25, 1958 and Marcia Lou Scofield, born Feb. 23, 1961. Marcia was born on May 22, 1923 to parents Earl B. Dake and Bernice DeLeo Haskin at Bemus Point, N.Y. She attended Crouse Irving Hospital School of Nursing, Syracuse, N.Y. in 1944. She served as a 2nd Lt. Army Nurses Corps. from 1945 to 1946. She received a B.S. from Syracuse University in 1951, an M.A. from Teachers College, Columbia, N.Y. in 1955 and her Ed. D. in 1958. Between 1946 and 1948 she was the school nurse and a teacher at Greenwood and Jasper Central schools, N.Y. Between 1948 and 1950 she taught at Falconer Central School and Ogdensburg Public School between 1951 and 1952. From 1952 to 1956 she was the chairman of the Health Department of State University of N.Y., State Teachers College, Oneonta, N.Y. From 1958 to 1971 she served as the Dean of the College of Nursing, University of Kentucky. She served on the Div. Nursing Education NIH Dept. Health Education and Welfare from 1971 to 1972. Additional positions that she has held are; Director Department Nursing Education American Nurses Association, Kansas City, Dir. Project in Nursing Education Millikin University, Decatur, IL. She was the Director of Program Development Nursing and Health American National Red Cross Hdqrs, Washington, D.C. She has been a member of the Defense Department Advisory Committee on Women in the Service. Pansy was born to parents Earl B. Dake and Bernice DeLeo (Haskin) Dake. Arad was born on Oct. 25, 1818 at Holland, Erie Co., N.Y. to parents John and Sally Colby Dake. He married Margaret Ellen Andress about 1839. (She was born in 1819; she apparently died about 1852 to 1853). Margaret and Arad had five children. He married a second time on Dec. 23, 1856 to Lydia Ann Dean. (she was born Nov. 23, 1823 and was previous married to a Caleb Howard (m. July 5, 1835), Caleb died July 2, 1856, Caleb and Lydia had children: Lacava and Joseph). Lydia and Arad had two children. He moved to Wisconsin in 1852. They were living at Atwater, Town of Chester, Dodge Co., WI in June 1860. Arad died at Atwater, Dodge Co., WI on May 16, 1909 and was buried at the Atwater Cemetery, Dodge Co., WI. James was born in 1854 in Wisconsin to Arad C. and Lydia A. (Howard) Dake. Julia was born in 1855 in Wisconsin to Arad C. and Lydia A. (Howard) Dake. Milton was born in 1840 in New York to Arad C. Dake and Margaret Dake. Margaret was born in 1845 in New York to Arad C. Dake and Margaret Dake. Sidney was born in 1847 in New York to Arad C. Dake and Margaret Dake. A Sidney A. Dake was listed as a Private in the 12th Illinois Calvary during the Civil War from Chicago. John was born in 1849 in New York to Arad C. Dake and Margaret Dake. Alvira was born on May 2, 1851 in New York to Arad C. Dake and Margaret Dake. Family legend says she was born on a boat on Lake Erie. She married William Coleman on March 4, 1870. They had 3 children (Ava Ray Coleman born August 5, 1871, James Vernon Coleman born March 25, 1873 and William Coleman Jr.). On August 6, 1876 she married Alexander Clarence Carpenter (born Oct. 11, 1847 at Linden, Iowa Co., WI and died June 29, 1924 at Stockton, San Juaquin, CA). 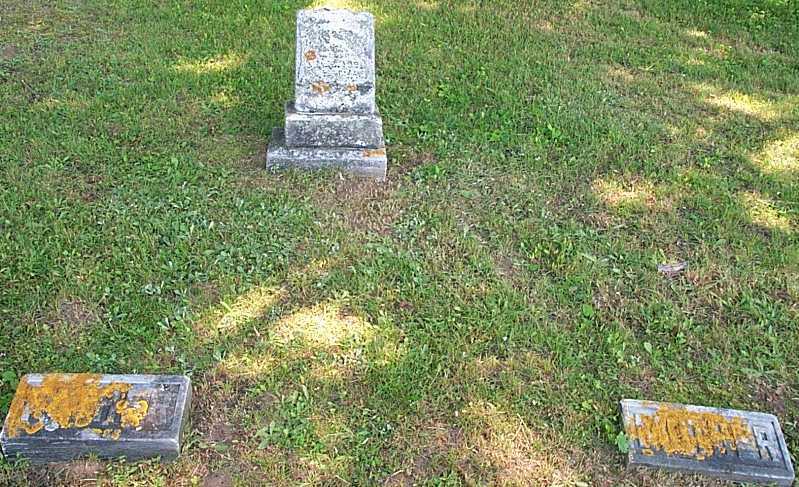 They had children (Clara born April 15, 1877 and died April 1, 1878, Arid Nun born August 2, 1879 in Wisconsin and ded Dec. 31, 1882, Alexander Colby Carpenter born Feb. 10, 1884 at Bancroft, Kossuth Co., IA and died Aug 20, 1957 at Madera, Madera Co., CA, Lydia Margaret born July 5, 1886 and died Jan. 15, 1961, John Harry Kenealy born Oct 6, 1889 and died on Dec. 1970, Thomas Sidney born Jan. 11, 1894 and died April 28, 1960. Elon was born in 1819 at Holland, Erie Co., N.Y. to parents John and Sally Colby Dake. About 1840 he married to Almira (last name unknown; nick name Polly, she was born in N.Y. in Nov. 1818 and died in Sept. 22, 1900 in Winnebago, Wisconsin). By 1850 they had moved to Chester, Dodge, Wisconsin. By 1880 they had moved to Omro, Winnebago Co., WI. He died 1886 in Dodge Co., WI and both he and his wife are buried at the Atwater Cemetery, Chester Twp, Dodge Co, Wisconsin. Selinda was born in 1843 in New York to parents Elon and Almira Dake. Almira was born in 1846 in New York to parents Elon and Almira Dake. Dennis was born in 1850 in Wisconsin to parents Elon and Almira Dake. 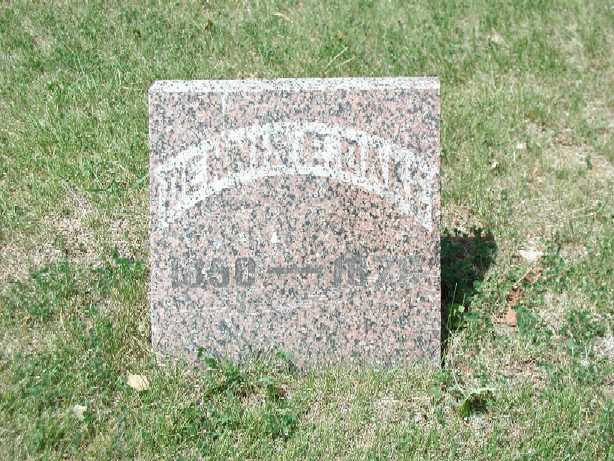 He died in 1871 at Dodge Co., WI and is buried at Atwater Cemetery, Chester Twp, Dodge Co, WI. Orlando was born in Jan. 1851 in Wisconsin to parents Elon and Almira Dake. In the 1900 Wisconsin Census; Orlando was listed as living in the town of Omro, Winnebago Co., WI His mother Almira (a widow) was living with him. George was born in the 1790's in Vershire, Orange Co., Vt. to parents Joseph Dake and Mary Button Dake. He died in Protection, Erie Co., N.Y. (The exact date of his death is unknown but he is known to have died at an early age). He is buried in Protection Cemetery, Erie Co., N.Y.